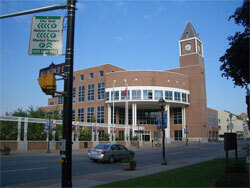 Brampton is the third-largest city in the Greater Toronto Area of Ontario, Canada and the seat of Peel Region. As of the 2006 census, Brampton's population stood at 433,806, making it the 11th largest city in Canada. It is also one of Canada's fastest growing municipalities, with an average annual growth rate (2001–2006) of 6.6%. With a median age at 33.7, it is the youngest community in the GTA. Brampton was incorporated as a village in 1853, taking its name from the rural town of Brampton, Cumbria, England. Visible minorities, combined, now form a large portion of the population. Brampton was once known as The Flowertown of Canada, a title it earned due to the city's large greenhouse industry. This included Dale's Flowers, a company that won many international rose awards for nearly half a century. Today, the city's major economic sectors include advanced manufacturing, retail administration and logistics, information and communication technologies, food and beverage, life sciences and business services. It houses the national headquarters of Loblaw Companies, HBC/Zellers, Bacardi, Brita and Clorox and other companies. From Wikipedia, the free encyclopedia.